I had been reading a lot on entrepreneurs when I was recommended this book. But before this book, it had only been about massively successful founders like Elon Musk, Steve Jobs, Bill gates etc. Reading only about them gets you into thinking big but at the same time you feel a bit intimidated by these personalities. You keep asking yourself if they were born geniuses, if you too could do something etc. Reading this book opened my horizons. 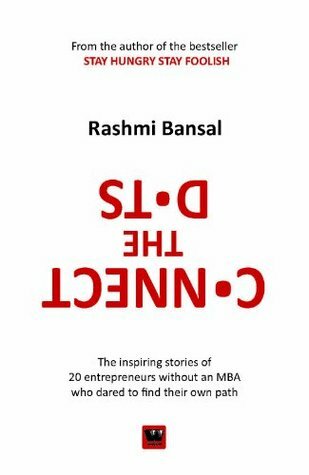 The book covers some lesser known entrepreneurs and goes on to show that its not only limited to software, its not only limited to silicon valley but entrepreneurship is all about seeing things around you and starting whatever you feel for. Its more basic than choosing a field you want to be in and finding a problem there. Its more about finding an opportunity in any field, any scale and any place. All in all a great piece encompassing a lot of variety. Indeed like the title says it did connect some dots for me. If you are dreaming and not able to find the one thing you would want to do, go for this book. If nothing else it will at least broaden your range so the problem is a touch simpler. Sign into Goodreads to see if any of your friends have read Connect The Dots.